we are manufacturer and exporter of Sterling Silver & Silver Plated gifts and articles. We supply to importers and wholesalers in the trade. 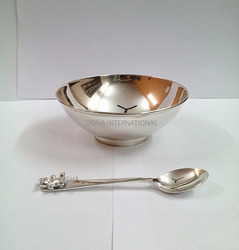 We have a vast variety of silver bowls, bowl sets with spoon or without Spoon. Trays, salvers and many more gifts. All products are polished to perfection by our expert artisans. Any pattern can be developed as per buyer's specifications exclusively for them. This is a beautifully hand crafted sterling silver bowl and teddy spoon set for world's all precious babies. no one can afford to leave this pretty gift for his or her gorgeous baby. A must gift for all toddlers. 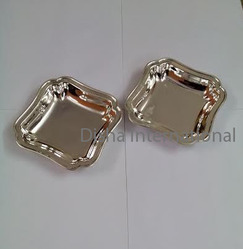 We are manufacturer and exporter of sterling silver gifts and articles from india to all parts of the globe and mainly to u. K.
We also assure for an international quality product with high polish and flawless finish of all silver products. our products are hallmarked by british assay office that itself stand gauranty to our products. This bowl is produced in all different sixes from 3 inches to 12 inches with different patterns of feet. We are manufacturer and exporters of sterling silver gifts and articles from india to all parts of the globe. This silver nut dish is of 4 inches square pattern. Any shape and size is possible to manufacture as per buyer's specifications and requirements. Round, oval, rectangular, square , triangular, pentagonal shape or any other shape can be given by our expert artisans. They are polished to the perfection as per international standards of quality. 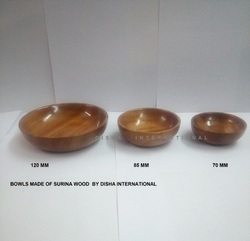 these bowls are made of mango wood in different sizes. They can be made as per your specifications and in all possible sizes. Beautifully finished bolws are a piece of decoration at any home or can be utilized as serving bowls for your evening parties. 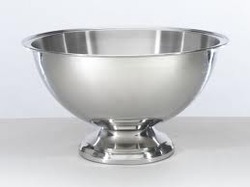 We are ranked amongst the foremost firms that are engaged in manufacturing, exporting and supplying a wide range of Silver Bowls which are widely used to store foods other purpose in varied areas like homes, hotels etc. 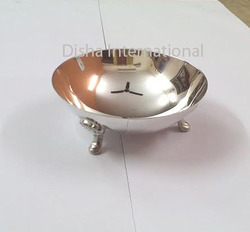 Offered bowls are manufactured using superb quality silver and advanced technology by our skilled professionals. Moreover, these bowls are well tested before these are delivered to the clients. We are offering customized products.